I think we all can agree that getting a package after ordering something online is so exciting! Even though you know what you ordered, you still feel like a little kid on Christmas morning when you open a package. You go grab a scissors to cut the tape, you open the box and..........oh no. It's not what you were expecting. It's not good quality, or it's just not what you thought you ordered. This has happened to all of us at some point in time. We are here to help you know that what you're ordering - is what you're going to get! When you look at some of our customer reviews, you will find that we have many happy customers who received just what they were looking for. We strive to exceed your expectations with our products and service! Upon your request, we will also send you a sample packet. With this, you can see the vibrant colors that our printers are capable of printing, and feel our selection of quality materials! 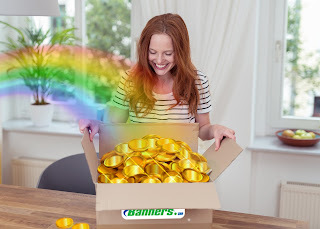 When you open your package from us, it will be like receiving a pot of gold! You don't even have to have good luck, you can count on us to deliver a quality product and amazing customer service. Here at Banners.com we take pride in printing and finishing your banners, decals, and other products. Each and every banner is hand finished and packaged for shipping allowing us to make sure your order is just what you’re looking for! 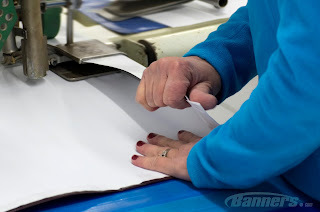 When ordering a banner from us, you are able to customize the size, material, artwork, finishing options and more! This allows us to fulfill your specific needs as best we can. Our Customer Service Reps are also Graphic Designers, so they are able to work within your requirements! Every order is custom, they are not produced in a factory with robots doing the work. There are real people putting in work and paying attention to the small details. You can feel good about your purchase, knowing that it's helping to support a family right here in the United States! No matter where you are in the world, you can buy a hand crafted banner! Our easy to use website makes it simpler than ever to order, from any location. Design your banner online, upload your own design or let one of our Graphic Designers assist you!